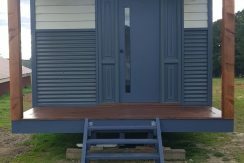 This is a unique opportunity to own the ultimate tiny home. Currently being refurbished, this motorboat offers the new owner an extremely unique Air B&B/rental home or the best kids cubby house in the world. Please note that it is the vessel only and the successful buyer will need to arrange transport to their own property. She offers decent accommodation, with a large double bed up the front, kitchen/lounge in the central area, toilet/shower and large covered back deck. The vessel has multiple batteries and a solar panel that keeps them topped up. It has a two large water tanks and a bucket load of character for the perfect remote rental accommodation. 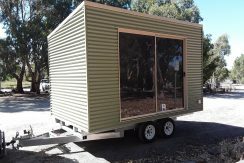 The home has a lovely fresh white and timber interior, carpet, bronze fittings, heaps of storage, stereo etc.